I became a big admirer of Richard Dawkins in the early 1990s. I would regard him - on the topics of religion and science at least - as one of the great living intellectuals. He is a significant thinker. He has the best definition in history of what religions are - powerful memes. He has the best explanation of why the ideas of Islam, for example, can gain millions of followers. I have never heard a better explanation than the meme view. This page is mainly about Dawkins' politics, which I felt were naive and foolish during the Bush era, but have got much better. Dawkins points out that religions are memes that spread by replication rather than by logic and truth. This is why they are geographically distributed. We all know this is true about religions we don't believe in ourselves. What Christian believes that Islam spread across the Middle East and North Africa due to logic and evidence? Due to Islam being true? Of course not. The idea is absurd. That is not why it spread. And that is not why it is today dominant in those geographic regions. So, on to Dawkins' politics. Dawkins comes from a Guardian-reading, liberal-left background. The same background I come from. But whereas I changed after 9/11, Dawkins did not. His writing in the Bush era of 2001-08 is classic left-wing doctrine. Hostility to Bush, right-wingers, America and Israel. Lack of outrage at the global Islamic jihad. No great desire to see it defeated. The left loved Dawkins in this era, and I was really disappointed by him. I felt there was a war on against Islamic religious fascism and he was not supporting it. I wished he would shut up about politics and stick to religion and science. Religion's misguided missiles, Richard Dawkins, 15 September 2001. Time to Stand Up, Richard Dawkins, 22 September 2001, makes one think that Dawkins is about to stand up against Islamism. But he was to disappoint us. Dawkins, 27 Sept 2001, shows how close he came to escaping from the liberal-left meme complex: "The chips are down, and I suddenly know whose side I am on. A world without Islam, indeed a world from which all three Abrahamic religions had been lost, would not be an obviously worse world in which to live. .. But a world which had lost enlightened scientific reason (which is at its best in America, and not only because more resources are spent on it) would be impoverished beyond all telling. So I hope I shall not sound too corny if I want to stand up as a friend of America. Even (and it feels like pulling teeth to say so) Bush's America." But the feeling didn't last. The moment passed. By 2002, Dawkins was back to bashing Bush and America, attacking Israel, and generally not supporting the struggle against Islamic extremism. And in 2003, Dawkins really succumbed to the collective madness that gripped the world over Iraq. His writing on this topic in 2003 seriously damaged my respect for him. Richard Dawkins, April 2002, signs an open letter calling for a boycott of Israel as Israel fights desperately against the same type of jihad Dawkins claimed to be against in 2001. Pathetic stuff. Heroes and Villains of 2002, The Independent, 27 December 2002. Dawkins' "hero" is lunatic leftist Robert Fisk, who Osama Bin Laden also approves of. Dawkins' "villain" is US President George W. Bush, who has just destroyed the Taliban Islamofascist regime and is about to topple Saddam Hussein. Dawkins says: "This illiterate buffoon cheated his way into the White House ... he fanned [9/11] to his advantage ... to foment an unprovoked war that has nothing to do with terrorism and everything to do with oil. ... Bush is rightly despised throughout the world". William Sjostrom, March 1, 2003, fisks Dawkins. Dawkins attacks Bush and opposes the Iraq War, March 6, 2003 (also here). He supports following the UN - a collection of unelected thugs and religious dictators, dozens of whom would execute Dawkins if he lived in their country. "One might have hoped that the will of the international community would mean whatever emerges from the deliberations of the UN. Apparently it means the unilateral will of the current US government." Bin Laden's victory, March 22, 2003, shows how, for some reason, Dawkins is incapable of applying reason to politics. Compare his Indymedia-style hysteria to the cold, calm use of reason and defence of the Enlightenment by Victor Davis Hanson. The Blind Calumniator, Richard Dawkins by Paul Craddick. Dawkins Puts His Foot In It (again) by Derek James. Letter, August 23, 2003. He calls the brave allied troops that died to liberate Iraq "belligerent cowards". Letter, September 5, 2003. He gloats that "US armed forces are "overstretched", and that is exactly how they should be." What he is doing here is actually gloating over attacks by Islamic religious fascists on Americans and Iraqis trying to build a new society. He is also in this letter delighted that the Islamic religious tyranny of Iran will be left alone for the moment. Dawkins here is not an enemy of religious fascism. He is a friend of it. Offensive letter to George W. Bush from Dawkins, November 18, 2003, though it seems to be written by a teenager on Indymedia. Why does Dawkins' intelligence and reason seem to simply vanish away when he talks about politics? Richard Dawkins, George W. Bush, and Morality fisks Dawkins' letter in a spirit of sadness: "Dawkins was one of the great thinkers of the twentieth century." A comment on the above says: "As I read his letter's excerpts (along with the excellent fisking), this Bright man dimmed, dimmed, dimmed before my eyes. I better not hear about this kind of thing from Daniel Dennett"
Letter to Americans by Dawkins, October 13, 2004. After seeing the above, I stopped reading Dawkins on politics for many years. I still like his writing on science and religion, but I have been zoning out his politics for a long time. Dawkins was (of course) a ludicrous enthusiast for that fraud Barack Obama. He is hardly going to become a neo-con like me overnight. But something interesting has been happening to his politics. He has started attacking Islam more. And this is getting him disowned by the left. He's a long way from my position. But he is getting better. He has a lot of left-wing nonsense to unlearn about jihad, Israel, and the cause of Islamic terror. He may never quite unlearn it. I had been zoning out Dawkins' dumb politics for years. Charles C.W. Cooke, 3 Nov 2012, during the 2012 US election, brings me up to date on (of course) Dawkins' ludicrous enthusiasm for Barack Obama. Cooke is amused at Dawkins trying to say that Mormonism is nuttier than Christianity. We all know the only reason he is saying this is because the Republican Romney is a Mormon. As a comment says: "I do think that a Mormon Democrat against a Republican Christian would have been treated quite differently, and that certainly does Dawkins and his supposed commitment to intellectual honesty no credit." Cooke, who like me is sympathetic to Dawkins on science and religion, says: "Politics does funny things to people. ... I've very much enjoyed Dawkins's books on science, biology, and evolution, and I enjoyed The God Delusion, too. ... however .. it clear that whatever genius Richard Dawkins has for science does not extend into politics or current affairs. ... On the lecture circuit, Dawkins likes to explain to his audiences that faith corrupts thinking people. Alas, his love affair with Barack Obama appears to have proven him correct." Richard Dawkins, Dec 2012, gets religious lunatic Mehdi Hasan to admit he believes Mohammed flew to heaven on a winged horse. This is the kind of thing that increasingly gets Dawkins called a "racist" and "bigot" by pious, pro-Islam lefties. Dawkins is a long way from my position. But he is getting better. Richard Dawkins, Jan 2008, nails the slippery British Muslim, Mohamed Mukadam, Chairman of the Association of Muslim Schools, on the penalty for apostasy in Islam. He finally admits that it is death. Dawkins got into trouble with his fellow leftists for this tweet on 8 Aug 2013, even though it is obviously true. Nobel Prizes for Trinity College, Cambridge (just one college in one university in one country in the kuffar world). Loony left Owen Jones attacks Dawkins: "How dare you dress your bigotry up as atheism. You are now beyond an embarrassment #notinmyname"
A guy who openly admits he is a socialist is not really one to be talking about "embarrassment". Science writer Martin Robbins at the left-wing New Statesman, 9 Aug 2013, shows how, despite all his years of service to the anti-Israel and anti-American cause, Dawkins will be cast out by the left as an apostate without a thought: "he is beginning to sound disturbingly like a member of the far right - many of his tweets wouldn't look out of place on Stormfront." Dawkins replies to his critics, 9 Aug 2013: "I don't think skin colour has the slightest bearing on ability to win Nobel Prizes, whereas it is highly probable that childhood education in a particular religion does. Educational systems that teach boys only memorisation of one particular book, and teach girls nothing at all, are not calculated to breed success in science. ... If we count only science prizes, discounting Economics, Literature and Peace, Trinity's count drops to 27 and the Muslim count drops to two". While it's good that Dawkins is breaking with the likes of Owen Jones, he's still too left-wing for me. Maybe someday Dawkins will join my world, and realise he was wrong about Israel and America and Bush. Not in our name: Dawkins dresses up bigotry as non-belief - he cannot be left to represent atheists, says young, far-left, anti-Israel atheist Owen Jones. I feel that way about Owen Jones: "I'm also atheist, but since I'm not loony left @OwenJones84 does not speak for me." An incident in 2015 showed how much Dawkins is now being disowned by the left. In Feb 2015, radical atheist Craig Hicks was charged with killing 3 Muslims at Chapel Hill, North Carolina. His Facebook showed he was a big fan of Richard Dawkins - though also of many other atheist groups, gay rights groups, left-wing media and even the Southern Poverty Law Center. But, for some reason, they all got off scot free, and Richard Dawkins got blamed. As if Dawkins has ever called for terror attacks. The idea is laughable. It was a dynamic similar to that which blamed Sarah Palin for Tucson and blamed Robert Spencer for Norway. A disgusting lynch mob, spreading a blood libel. 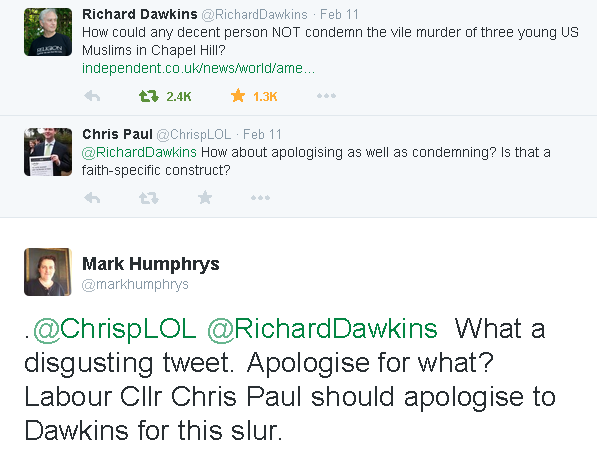 UK Labour Councillor Chris Paul is one of many people trying to link Dawkins to the killings. Anti-counterjihadist Reza Aslan made a sinister attempt to link Dawkins to the killing. This is the same creep who tried to blame Robert Spencer for an Islamic honour killing in 2012. 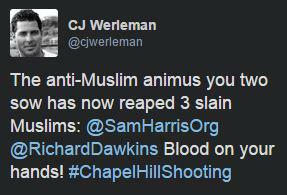 CJ Werleman tweeted that Dawkins and Sam Harris have "Blood on your hands!" But then he had second thoughts and deleted the tweet. Now Dawkins knows how Sarah Palin felt after Tucson and how Robert Spencer felt after Norway. The Chapel Hill killer declared on Facebook that he was a fan of gay leftist Rachel Maddow. In contrast, the Tucson killer never showed the slightest interest in Sarah Palin, and had opposite politics to hers. But Palin is blamed for Tucson, and Dawkins is blamed for Chapel Hill! Hilarious: Popular communist radical, Jan 2017, says that liberal, left-wing, Republican-hating, Trump-haters Richard Dawkins and Bill Maher are "alt right". Words that the left has drained of all meaning: Racist. Fascist. Nazi. Far Right. Alt Right. It doesn't matter who you are. If you deviate from leftist orthodoxy on Islam, you will be called those words. They mean nothing. Despite Richard Dawkins' years of service to left-wing nonsense, the left has turned on him because he is now criticising the religion of Islam. Comedian Andy Kindler provides an example of the abuse that Dawkins now gets from the left. Comedian Andy Kindler says Dawkins and other left-leaning atheists form a "hate group" because they criticise Islam. I point out that not tolerating diversity of opinion among brown people is kinda racist. 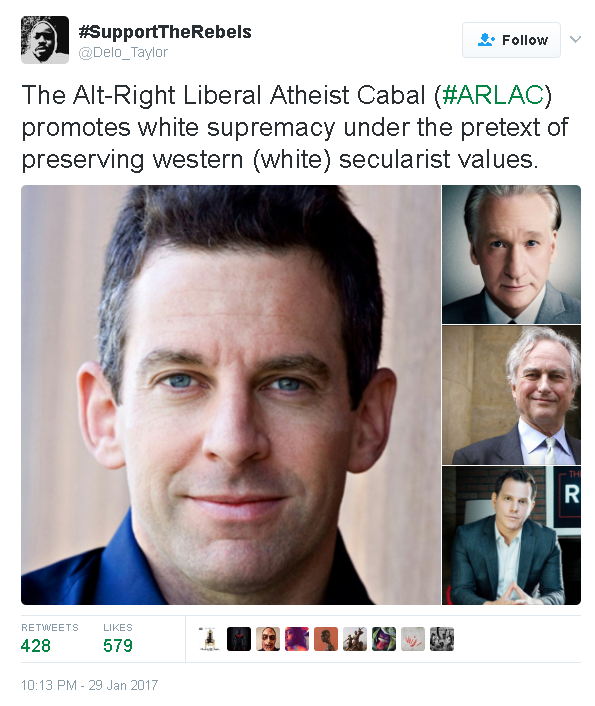 White people can be atheist rebels but brown people are not allowed to be? Kindler responded by blocking me also.